A video on the internet went viral as it shows a mother combing millions of parasites crawling through her child’s hair. Experts have described this predicament as an extreme case of head lice. The clip was posted on Youtube as the mother struggle to run a fine-toothed nit comb through her daughter’s locks, which appear to be filled by white and green insects. Countless of squirming lice are revealed as the camera focuses on the comb. A lecturer at the University of Reading’s School of biological Sciences, Dr. Alejandra Perotti identified the infestation as head lice and is surprised at how severe it had gotten. She said in a statement that the infestations are very common in UK and in other parts of Europe but not to the point of this level. “I work in forensic sciences and these types of cases are found in cases of neglect of children or the elderly. You also see it in the case of homeless people,” Perotii added. Pediculosis capitis, or most commonly know to all of use as head lice, are tiny insects which grow to the size of a sesame seed that live in the human hair. These are parasites as they feed themselves by biting the scalp and feeding on blood. The female lice lay their eggs close to the root of the hair so that the eggs will be kept warm by the scalp. These eggs hatch into more lice which rapidly breed and multiply. In terrible cases such as this one, Dr. Perotti added that children would often develop a condition one could call ‘plica polonica’ where all the hairs get glued and stick to one another causing it to be difficult to brush. The child in the video is almost in that condition according to Perotti. The lecturer also stated that the nits are glued with cement to the hair by the mother louse, very close to the skin. The hair should be cut very short so that the female louse could no longer lay her eggs. Even if the child receives treatment, she will still get lice for about a year as the old nits still become visible. Dr. Perotti also explained that all human lice have a bacterium living inside them. The underused method of treating these lice is the use of antibiotics. If the host is to be treated through the use of such antibiotics, it’s likely that the bacterium inside them is killed and the lice die for they can’t survive without the bacterium. The antibiotic needed to kill the lice doesn’t need to be expensive or new. Any simple and mild antibiotic will do. Founder of Hairforce salon, Dee Wright, agreed this case is on par with some of the worst hair conditions she had faced in any of her salons, which all offer a specialised ‘Lice assassins’ service in various parts of the UK. Given that the lifespan and breeding capability of a certain female louse is 30 days and she lays upto 10 eggs per day, it is not hard to see how such extreme infestations occur since things move quickly and rapidly for the head lice. Imagine 200 eggs hatching at the same time and they grow up and mate and lay more eggs. She added that this sort of events happen because parents rarely check their children’s hair regularly. Director of the Medical Entomology Centre in Cambridge, Ian Burgress also told MailOnline that it was very likely that the child had developed this situation after suffering with lice for several months and no one really actually do anything. Reaching that level could have surely taken months! Head lice are also one of the reasons why people’s head itch when they are allergic to them. However, not everyone is allergic to lice and the lack of itchiness can lead to the lice becoming undetected and continuing to multiply. Ms. Wright added that lice could affect a certain child’s health because they carry bacteria. When they feed, they inject saliva into the scalp. That saliva contains an anticoagulant which may bring on mild flu-like symptoms. She recommends that combing is still the best way of treating head lice. Dr. Perotti also agrees for frequent biting of lice and scratching may lead to open wounds where bacteria and fungus may colonize. Parents are advised to use fine tooth comb on wet hair and should clean the comb of lice after each brush. 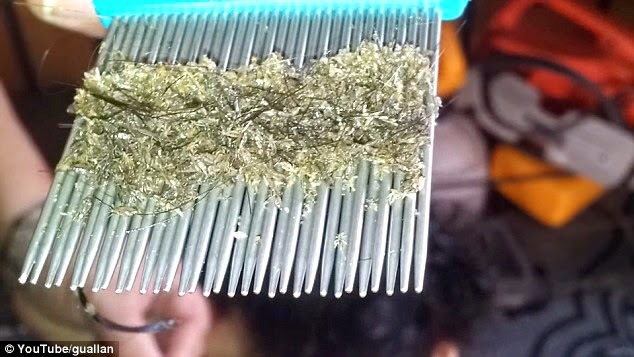 The woman in the video seems to be doing the wrong thing for she does not clean the comb after each brush, causing the lice to drop back into the hair or unto the floor and the child’s hair is not moist enough so she was practically tearing the little girl’s hair from her scalp. Also, research have found that there had been an increase in the cases of head lice among young people and one of the many reasons of the said are selfies. That’s right. Selfies. Experts say that it may be due to the head bumps that occur during selfie snaps and head lice spread through head-to-head contact.